Sometime mid-vacation, the ghost building which once comprised of Kickstart and Tata Book House had at least one of those former occupants replaced. 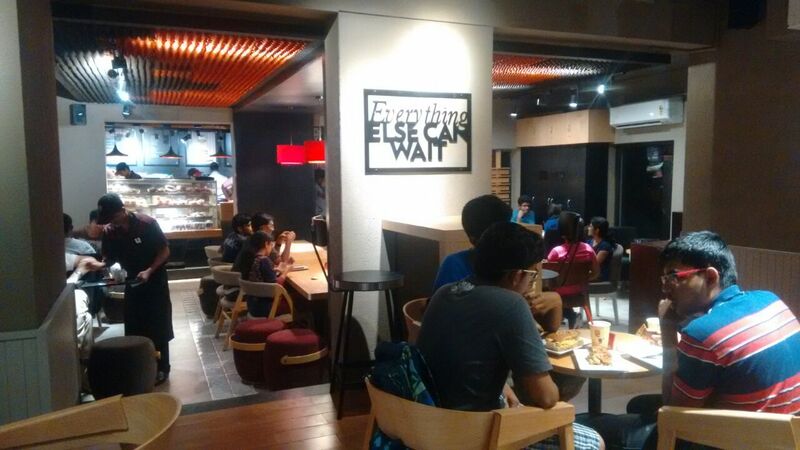 Cafe Coffee Day had once again moved into the ground floor after a year-long hiatus. The opening of CCD brooked a collective sigh of relief from many in insti, especially the inhabitants of Sarayu and Sharavati hostels, who now had a viable option to mess at walking distance once again. Packed to the hilt on the opening day, despite vacations, the queue was quite a wait. I returned again as semester began. Sporting their usual menu, with cold coffee, chocolate milkshakes, (two types of) cake, cupcakes, burgers and salty snacks – garlic bread, cheese croissants… the list is long, and thus provides an extensive range of choices. In addition to this, there are also some strange, to say the least, additions such as idly sambhar (the feel of South India) – for breakfast perhaps? Which would make little sense, since it only opens at 11 am. And therein started my first peeve with the place – it is not a feasible breakfast option. Entering through the glass door at the end of a strange elongated corridor, to the strains of Justin Timberlake’s Mirrors, the first thing one notices is that their playlist is pretty good. The second thing one notices is that the décor is a definite upgrade – clean, tasteful and slightly edgy (read: bizarre) – egg cartons on the ceiling. The third you notice is probably the huge queue in front of you at peak hours, and the fact the diminished number of tables are filled (casualty to the new décor). Some are placed outside, but in Chennai, nobody wants to be outside. The fourth thing is probably that after you spend half an hour in the queue (no exaggeration), the strains of Mirror starts playing again. The wait, however, doesn’t end with placing your order. During the peak hours, you might have to wait for a good twenty minutes before parts of your order slowly start reaching your table. This long wait, is without a doubt a setback that can’t be ignored in the case of CCD’s return to insti. Crossing the hurdle of actually getting food (ordering and receiving your order past) the food is usually and almost uniformly good. At least, so far. I hope the quality is maintained in the months to come. Cool Blue/Lemonade: Mostly crushed ice with some confusing intermittent flavour. Teeth sensitivity and mouth numbness will set in. Hazelnut cake: Absolutely delicious, light, cream with a lovely sprinkling of nuts. 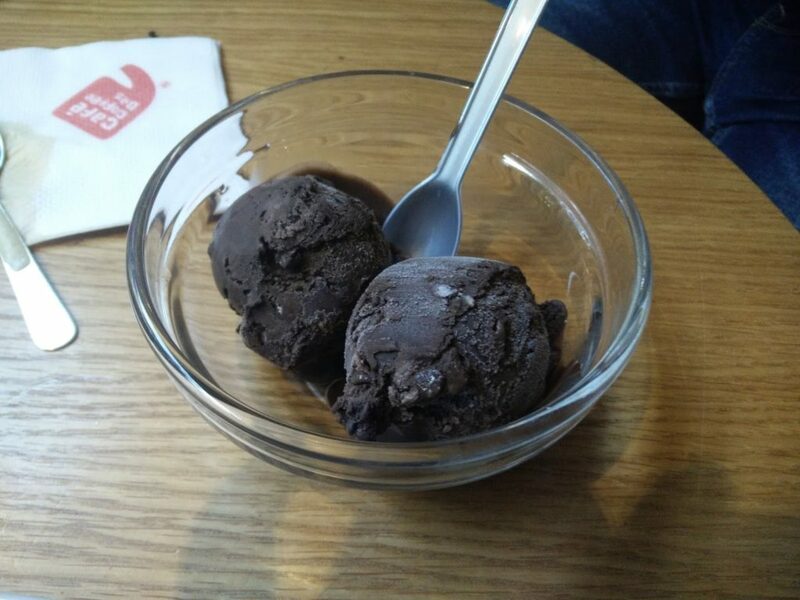 Chocolate ice cream: Tastes like frozen Nutella. Rich chocolate with an undertone of nuttiness (despite no visible nuts). The Major Dessert items on the menu: Twilight Dessert (image featured at the top of the article) is a nicely decorated plate with a slice of chocolate truffle cake, and a couple of scoops of CCD’s Vanilla ice cream. 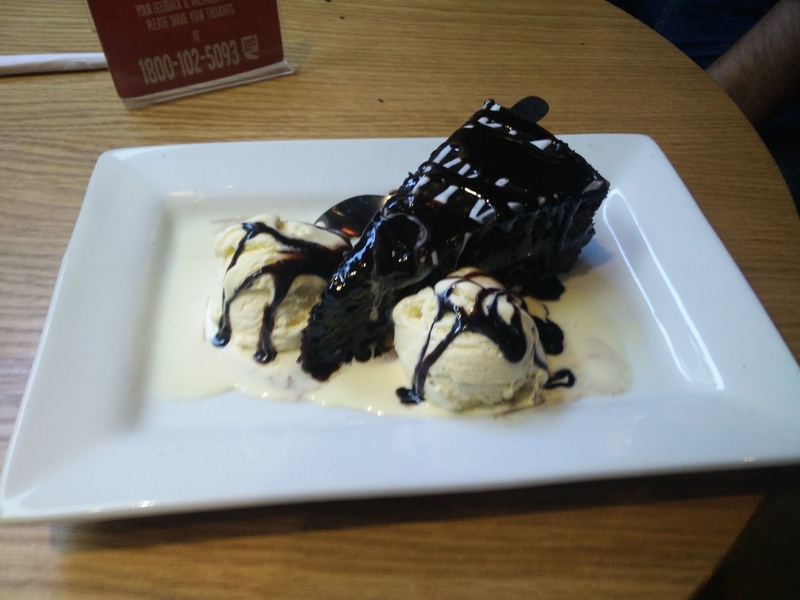 This, while contrasted with the other major dessert item on the menu, Dark Passion, which consists of a lot of CCD’s wonderful chocolate ice cream with some cake, with a fine balance of flavour and texture, leaves no room for doubt that the latter is indeed the best dessert on the menu. Both these desserts cost 88 bucks each. Crunchy Frappe: Chocolate drink with fragments of Oreo. Can’t really go wrong there. Chicken/Veg burgers: Very nice, filling, with sufficient vegetables and a patty which can only be described as classy. Chocolate cupcake: Bite sized chocolatey yumminess with an appealing cream swirl. Garlic bread: With cheese; including garnish which has actual pieces of garlic, it appears to outdo pizza-side garlic bread and simultaneously confuse one because…the garlic’s separate? And really strong. Chilli cheese toast: Fancier than the garden variety cheese toast, it’s also more expensive. There are no actual cut pieces of chilli blanketed under cheese; cut vegetables add to the appeal. 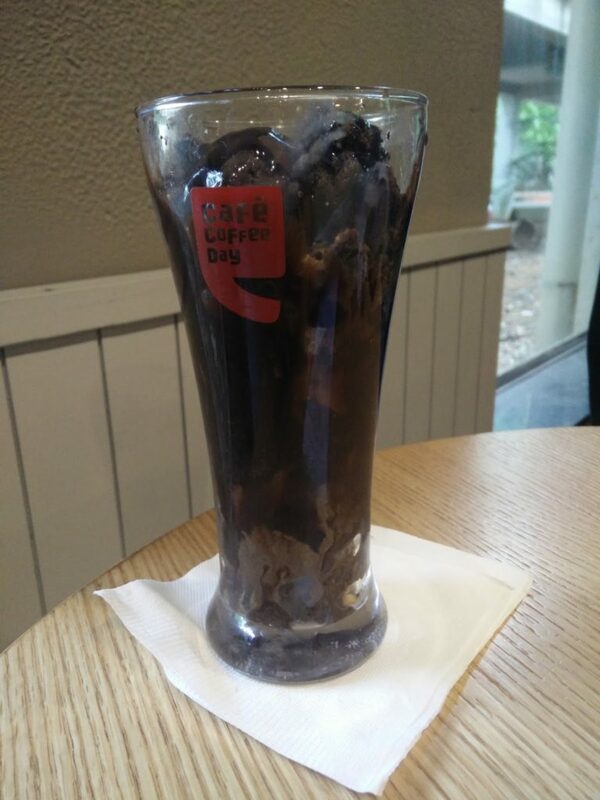 Although subsidized, CCD will however take a heavy toll on your wallet. In a world of Oreo milkshakes at 20 rupees, CCD seems ludicrously overpriced. It’s a toss up – ambience and quality versus well, 20 rupees. Bottom line: We will eat anything other than mess food. Bottom line 2: A good place to meet up with a friend, occasionally have lunch, but probably not a convenience food joint. Note to CCD: Providing free wifi would make it a nice place for meetings and working, and provide use for that humongous long table in the middle. PPS: Download the CCD app on your phones. If you use a friend’s Referral Code, you’d get 100 beans free to start. These beans can be redeemed for any beverages at CCD. Each bean is worth one rupee. Furthermore, you can earn more beans by showing your phone at the counter every time you buy something at CCD, for they credit a bean for every ten rupees you spend at CCD. Please note that beans can be redeemed only for beverages.